One of the talents I’m often called upon to exercise is the combination of my portrait skills and my digital compositing techniques to solve logistical issues. Large scale corporations, and their highly paid, busy executives don’t always have time to engage in complex location portrait projects. A shot like this one would involve waiting for the perfect day, weather wise; scheduling the perfect time of day for maximum dramatic effect and perhaps even halting some operations about the facility to provide for a clear background. Oh yeah...that busy executive would have to be on site waiting for the perfect moment when he could be doing something much more important for the company. Through the magic of digital manipulation such a perfect scenario is no longer required to achieve the perfect shot. The image you’re looking at here is such a composite. The executive, who’s time was at a premium, was photographed in my East Northport, Long Island studio at an appointment time that was convenient to his busy schedule. The actual session took less than ten minutes as everything was set up and tested before he even arrived. The background shot was captured weeks earlier at sunrise, some 50 miles from my studio and halfway across the Untied States from the firm’s corporate headquarters. The two images were then composited together to create the finished image you see here with the executive superimposed over one of it’s corporate installations. The perfect person in the perfect place at the perfect time. You will see other examples of this specialty of mine here on this web site. The possibilities are limited only by your imagination. Give me a call to discuss your objectives that seemingly can’t be achieved due to logistical or productivity concerns. Together we can create the most amazing image for your corporate communications, web site, annual reports, advertising or editorial needs. As an added note: Images like this don’t absolutely require an appearance at my New York studio, either. 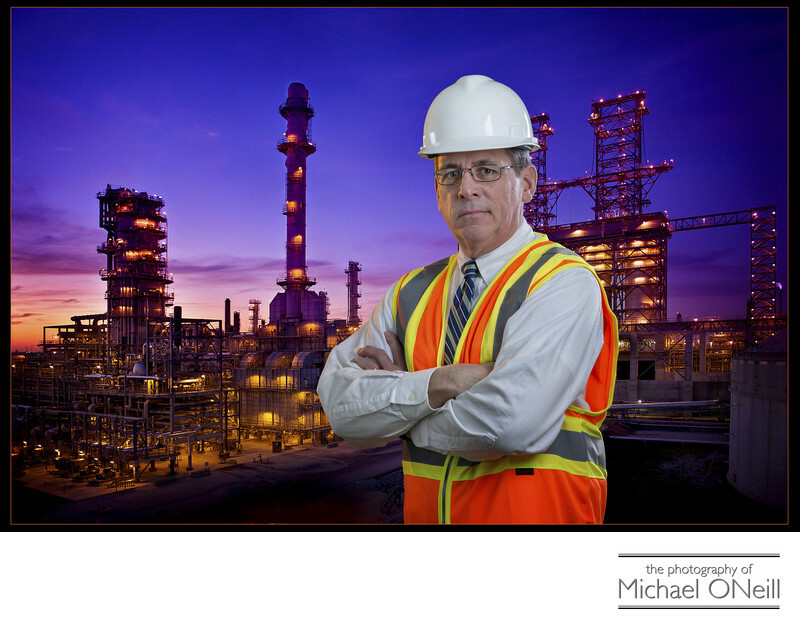 All of my gear is portable and I can be retained to produce the executive’s portrait at any location of your choosing.